We all use Google. It is a fantastic service. It dominates our lives in many respects, especially when it comes to the way in which we structure our websites to try to achieve that elusive page one ranking. When Google’s founders, Larry Page and Sergey Brin, came up with the slogan “Don’t be evil,” it seemed to reflect their company’s status as a benign superpower, intent on doing good for mankind. To an enormous extent that is still true. "Google users trust our systems to help them with important decisions: medical, financial and many others," the letter read. "Our search results are the best we know how to produce. They are unbiased and objective, and we do not accept payment for them or for inclusion or more frequent updating ... We believe it is important for everyone to have access to the best information and research, not only to the information people pay for you to see." Then, when Alphabet became Google’s parent company in 2015, it enjoined its employees and its subsidiaries and controlled affiliates to “do the right thing—follow the law, act honorably, and treat each other with respect." 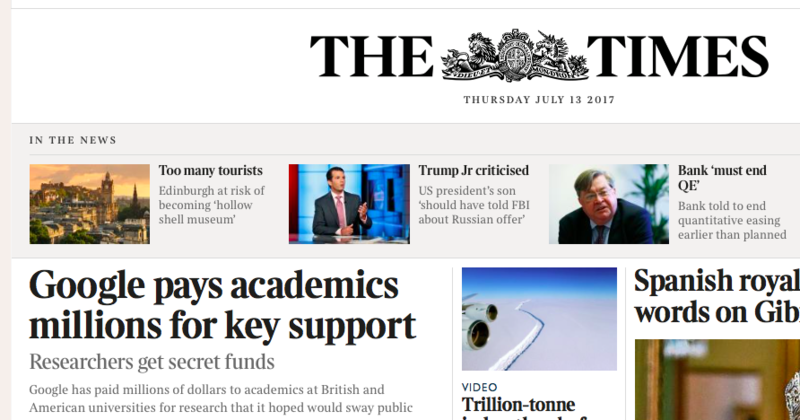 Today, The Times reports that “Google pays academics millions for key support.” These academics, in the USA and the UK (including Oxford and Edinburgh universities) were, it is claimed, paid to produce articles that Google hoped would be favourable to Google’s interests. There are even claims of some collusion between academics and Google and “Much of the research made arguments in Google’s favour.”Some of the academics, whom The Times names, did not declare the funding from Google. The payments made to the authors ranged between $5,000 and $400,000. Don’t be evil? Do the right thing? Our results are the best we know how to produce…. unbiased and objective? Any company that is perceived to be behaving in an underhand way, whether or not it is true that is has, is courting trouble.